Paolo Bacigalupi. The People of Sand and Slag. Bacigalupi’s ‘The Fluted Girl’ (F&SF June 2003) was one of my favourite stories of last year, and in constrast to that fantasy tale, here he takes on SF. He postulates a not-too-distant future in which the Earth is a seething, war-reduced, inhospitable environment – or rather, an environment which would be inhospitable to us as we are now. In his future humanity has embraced nano-tech and genmod to the extent that even the sand and slag of the title can sustain us. A rapid response armed unit, guardian a mining operation, are able to do so with extreme prejudice thanks to the tech and the military hardware that they have at their disposal, and the near superhuman regenerative powers which they have. To my mind, the author goes just a little too far in this repsect! The nature of their humanity (are they really human?) is investigated through their finding (somewhat unbelievably) an honest-to-goodness dog. Searching their computer archives to find out how to look after such a beast, there are initial glimmers of humanity from them, but sadly not enough for the dog to survive. One of Cowdrey’s regular F&SF stories set in a New Orleans populated with larger than life characters. Here a wannable rapper (white boy from a nice family) has the misfortune to run up against a copy with no compunction about shooting first and asking questions later (actually, he doesn’t bother with the questions). The young dude is sufficiently evil to come back and seek vengeance through his spirit possessing a lower form of life. However, he is also unfortunate in being up against a resolute lady with certain powers, who manages to repeatedly rebuff his attempts at vengeance, reducing him to a return in ever-decreasingly sized creatures of the night. Another in the author’s Silurian Tales sequence – although rather than visiting the past/alternate Earth with a team of scientists, we find out what has happened to a devious billionaire who has used his money to bring something back through the portal. The story is a bit at odds with the others in the series, in terms of its slightly ironic tone and use of TM when mentioning various software programs. IMHO it would have been better to have set the ‘story’ in another setting, and thus not have been constrained by maintaining consistency with the setting of the Silurian Tales. Daryl Gregory. Free, and Clear. One of those stories where the feeling after reading it is ‘fine, as far as it goes’. A man whose life is being ruined by allergic rhinitis, seeks help from someone whose methods of dealing with his problem are most ‘alternative’ in the extreme. The therapist’s techniques becoming increasingly off the wall (or, rather, hanging off the ceiling), until clear nasal passages are attained through a rather fundamental change of location. Ysabeau S. Wilce. Metal More Attractive. A first published story from a short writer (sic). It is always a pleasure when a first story stands out from the crowd. In this case, Wilce’s story, whilst not being faultless by any means, does show a degree of invention and creativeness than is often not displayed by those authors with a more substantial track record. So, here we have a story in several parts, featuring some strange characters in a strange setting. I was almost immediately minded of parts of the film ‘Spirited Away’, and the Pokemon/Yu-Gi-Oh TV series, in the affected, mannered society described by Wilce. Hardhands is the grandson of the Pontifexa of Califa, and he has been betrothed to his infant neice, Tiny Doom. Hardhand’s sister, Little Tiny Doom’s mother, is dead, murdered perhaps by her husband, Lord Brakespeare, who has designs on his daughter and the power which will one day be hers. There is treachery afoot, a strange illicit partnership, and macgicke, my friends. The initial link to Pokemon/Yu-Gi-Oh was reinforced by a character called Paimon (Piedmon I am reliably informed by my youngest son was a character in Yu-Gi-Oh), and further by Hardhands use of Tarot/Yu-Gi-Oh-type cards to foretell the present and the future. Worth a read as the author has obviously put more effort into creating a new world than you get in a shelf full of a lot of genre fiction – you can get a glimpse of said world at http://www.yswilce.com, and the story regularly pleases with neat little touches and flourishes. Chet Williamson. The Pebbles of Sai-No-Kawara. An Oriental myth about the lives in hell awaiting those children who were (through abortion or miscarriage) not born, provides a horrific setting into which a man coming to terms with a terminated pregnancy in his early life (or, rather, his partner’s) comes face to face with the results of that action. Robert Reed. River of the Queen. 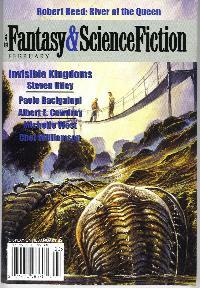 It is a tribute to Reed’s awesome invention that it has taken him a full decade to return to the setting of ‘The Remoras’, published in F&SF, May 1994, and collected by Dozois the following year. Quee Lee and Perri are a couple living on an alien spaceship/arteface of planetary size, which has been colonized by a huge number of races over its galaxy-trekking journey. The couple are themselves virtually immortal, and their longevity necessitates new experiences to excite their jaded palates. A lesser writer would have returned to this setting many times, and the only disappointment is that Reed’s return doesn’t quite live up to that earlier story. We witness, with Quee Lee and Perri, an exceedingly strange race living in part of the immense vessel, a race who are about to become extinct, but who will live on through a Queen containing DNA which she will nurture through the forthcoming (and cyclical) ice age. Having set up an intriguing setting, the story ends with a quick bit of cloak and dagger kidnapping, which has a slightly rushed feeling to it. A good issue, with something to please pretty much everyone.